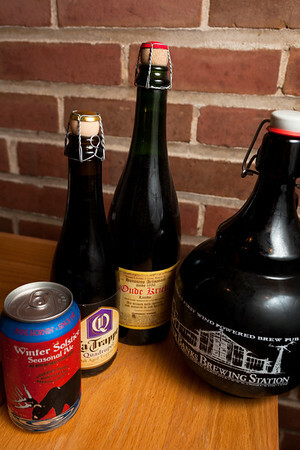 Brauhaus Photo of the Day: January 24, 2012 - State of the Union or 4 More Beers! January 24, 2012 - State of the Union or 4 More Beers! In honor of the State of the Union address tonight - we have here "Four More Beers!" Hopefully this should be amenable to folks from either side of the aisle, give or take the teatotallers party, which I'm not too concerned about. The beers pictured here include the 80 Shilling from Mad Fox - shown here ensconced in a Outer Banks Brewing Station Growler, Oude Kriek from Hannsens's, La Trappe Quadruppel and Winter Solstice from Anderson Valley. Yes, these are "just the beers in my fridge" at the moment. Or, rather, some of them. Some are local, some aren't. In the spirit of bi-partisanship, we'll drink each of them. Photo was taken with my Canon 5dII and the Zeiss 28mm lens. Used flash - mounted on a light stand, to the right of the photographer. Shot the flash through a white "shoot through" umbrella, which you can see clearly if you look at the reflections on the bottles.